Max has checked off three more doctor’s appointments, all of which resulted in good news! Yippee! First up was his final appointment at Mary Bridge. We met with his surgeon who checked out his incision. She gave him a thumbs up on its’ healing and unless we have any further concerns we don’t have to go back! So very happy to have surgery days behind us. Here we are saying goodbye to Mary Bridge! Next was a trip to Seattle to meet with genetics. Our hope was to gain some insight on whether or not Max actually has hemihypertrophy. 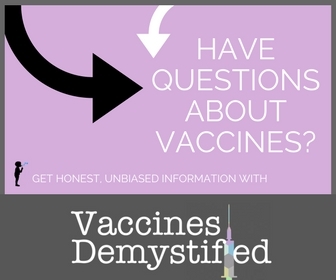 Thus, whether or not we need to follow a preventative regimen of serial blood work (every 6 weeks) and ultrasounds (every 3 months). On appointment day, we left early, grabbed fuel (grande double decaf americano with pumpkin sauce and extra cream!) and made our way north. My sister, Hannah, came with me for an extra pair of hands. God bless that girl! Plus, she has a super science mind so I figured she was good to have along. Practically a 4.0 as a Biology major! We arrived just in time for Jemma to announce that she had flooded her pull-up and car seat :( Thankfully, I had prepared for the day with changes of clothes! Point for mama! We cleaned up and made our way inside. Jemma was enthralled with all the ocean artwork – so nice that Children’s does what they can to make the hospital a happy environment. I forgot to mention that before margaritas Dr. Miller squeezed us in for some x-rays of Max’s legs. With his chubby rolls (officially called subcutaneous tissue, hahaha!) and “girth” as he called it, Dr. Miller wanted to get an accurate measurement. He planned to call Max’s pediatrician with the results and make a plan of action from there. Now, here’s something fabulous … the next day, less than 24 hours after Max’s x-ray, Dr. Miller called me. Not his nurse or some assistant. Him. He actually left a message because I was in the middle of preschool drop off, but still. He picked up the phone and dialed my number to tell me that Max’s legs are 32 cm and 32.4 cm – even for all intents and purposes. He didn’t recommend any further appointments with genetics and felt that our pediatrician could oversee Max’s care from this point forward. In fact, he had already called her to talk over his findings and give her pointers on how to watch for asymmetry at his check-ups. Ok, so we left Seattle. Got margaritas. Browsed Nordstrom Rack for bridesmaid wedding jewelry and then drove home while the kiddos snoozed. That was all Monday. 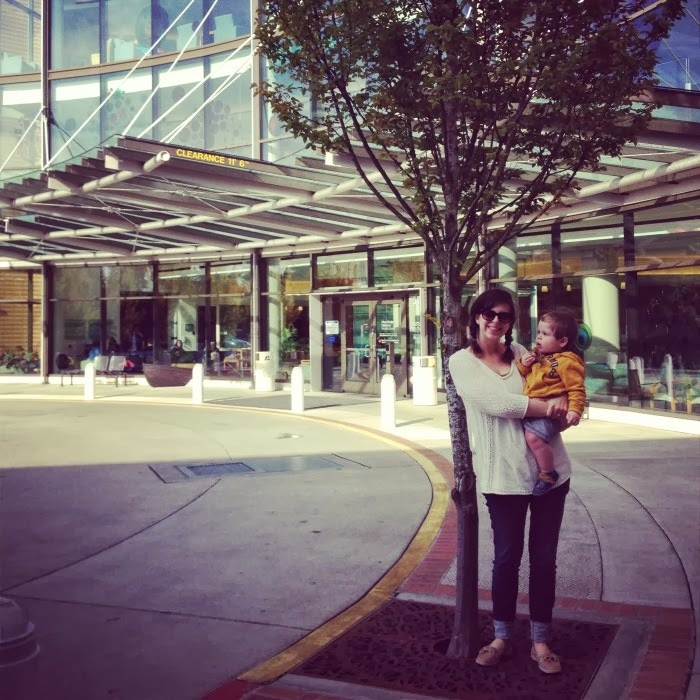 On Friday, Jemma had her 3 year wellness check up and I had a chance to chat with their pediatrician about our Seattle trip. The only thing we are planning to do from this point forward is an asymmetry screening every 6 months. So, not much more than Max’s normal wellness visits. Yay! Relieved is an understatement in describing how I feel about all this. I’m so thankful I can close the door on Max’s surgery and the whole hemihypertrophy potential. My little boy is healthy and growing, praise the Lord! Here’s a peek at Max’s thumb about 2 months after surgery … it’s looking good and healing well! I’ve been lathering his scar with coconut oil to aid in the healing. Soon I’m going to be giving DoTERRA’s Immortelle essential oil blend a try at lessening his scar. I figure it’s best to care for his scar as much as I can while it is still fresh. I’ll keep ya’ll posted on how it works as I’m sure we all have some scars, spots or stretch marks that could use some healing. If you decide to order some, you’re welcome to order through my doTERRA shop. Thanks again for all your love and prayers as we’ve journeyed through Max’s surgery and other surprises. You’re seriously all such a blessing to my family and I! I tried for days to get a decent photo of Max’s thumb – he’s a wiggly one and sleeps in the dark so this is the best I could do! Oh this is such wonderful news! I <3 his chubby little hand! And props to your sister for going with you… it's always nice to have that 1:1 ratio when you're in doctor's offices. Speaking of which, mega high fives to Dr. Miller! That's awesome he was so proactive and considerate! Praising God for your family and Max's healing! Such wonderful news! Thank you Jesus! I know! It was such a good news kind of day! Thanks for all your love! yay for max! so glad you got great news! Thank you for this post!! I found you through Pinterest- your post about toddler casts. 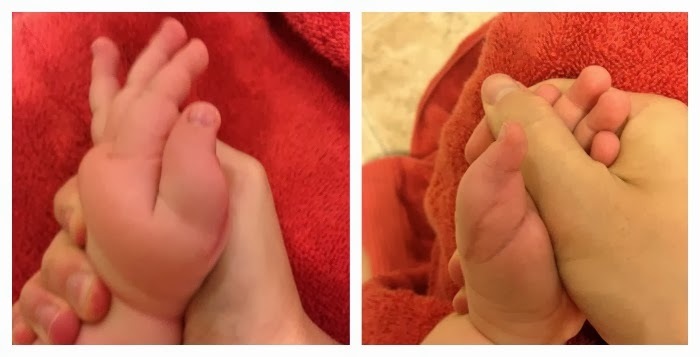 My daughter is having her third thumb removed at the end of this month and I’ve had NO luck finding before/after pics. So glad this all went well for you!